What will flash in your mind if you heard ‘Bali’? Claimed as one of the most beautiful island in Indonesia often raise people’s curiousity about the land. Aside from the nature and the culture, what else can Bali offer to us when we are visiting? The culinary is the answer. Any different food to be tasted? Check this out! A classic dish of Bali goes to Babi Guling, because it is well-known in every region of Bali. There are tons of restaurants having Babi Guling as mainstay course. This food is also close to the locals’ heart. 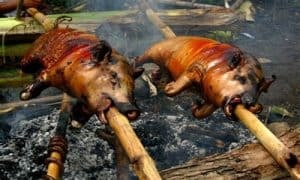 Almost all of the traditional ceremony or any parties served Babi Guling for the guests. Roasting is the way to cook this dish, and at the same time you have to rolled the pig to make sure that every part is spread evenly. Often associated with Yogyakarta’s Nasi Kucing, this is mini size rice from Bali. The size is about a hand grip of adult. The complete serving is by adding a little vegetable and simple protein. Mostly fish or chicken slice. It is served traditionally with banana leaves. 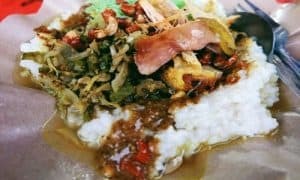 Although popular as food street, this Jinggo rice is easily met in a gathering, office meeting, reunion, and other occasions. A cuisine of mixed vegetables, mince, coconut. Using a lot of herbs, such as pepper, tumeric, salt, grated coconut and galangal nails to make your tongue experienced a sensation. There are many types of Lawar based on the ingredients used. If the chef use pig for the protein, then it’s called Lawar Babi. When it served with chicken, it comes with Lawar Ayam. 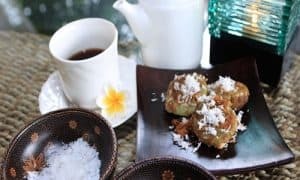 This is a famous recipe from Bali. Most of food in Bali always have Sambal Matah as the complement. It is served raw, and steps to make it is quite easy. The essential ingredients are garlic, onion, cayennes, shrimp paste, lime leaves, sugar, and salt. Combine all the ingredients and mix for a couple of minutes. 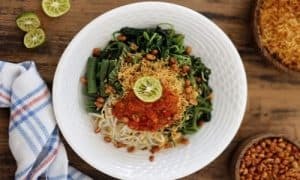 The final look of Sambal Matah is like a fresh salad. This dish is considered as a snack. 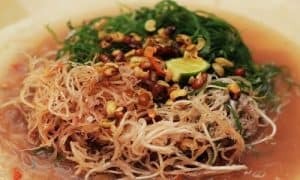 Comes originally from Klungkung,it is made by boiling many vegetables, such as spinach, beans, water lily, and fried peanuts. Not to forget the grated coconut, the important component in Bali culinary. As Sate in common, meat must be the star of this dish. There are several meat options you can decide, such as chicken, pig, or fish. Later, that meat is burned. Not to forget the uniqueness, this sate is not arranged with small pieces of meat, but smoothen meat. The meat is mixed with the seasoning and grated coconut. 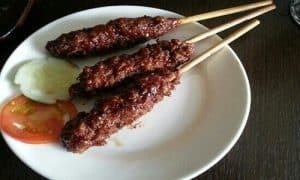 If you eat this sate, you don’t need condiment because basically this culiner is rich of flavour. However if you like condiment, you are welcome to. 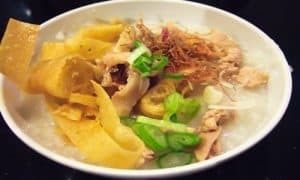 For porridge lover, this is a ‘must-try’ culiner from Kuta Bali. It is a right choice to eat this dish when the weather is cold. 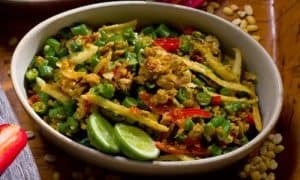 Urap, or a mixed of vegetables plus tumber and sticky rice is also made to level up the flavour. Besides urap, the chef usually put protein, whether chicken or fish on the rice. The ingredients for Bubur Mengguh are very available at market, but the cooking process is a little bit complex. Using black sticky rice and jackfruit is the signature of this traditional food. The cooking process yet still add white sticky rice, in a fewer amount than the black one. Its form of rice make us assume that it’s for the main course,but this dish is actually made for snack or a dessert. The texture is very soft and the taste is unquestionably toothsome. This can be the exact food after spending time at beaches. 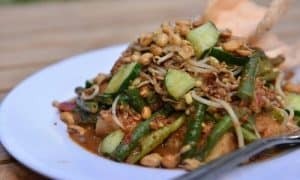 At a glance, Tipat Cantok may be look similar with gado-gado, but it’s not. Tipat means ‘ketupat’ and cantok means being mashed. Tipat Cantok can be found mostly in local stalls, and not many restaurants have this dish on their menu. As other Bali food, Tipat Cantok has its seasoning. They are peanuts, garlic, chili, brown sugar, salt, and lime. Indonesia is indeed one of the largest moslem populations in Indonesia, but Bali is an exception. Pig becomes the main component for many foods oftentimes. Satay Babi is actually an abbreviation. 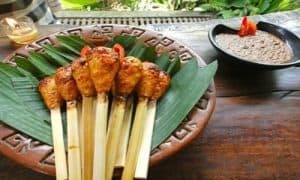 In Bali, sometimes you hear that the complete name is Sate Babi Bawah Pohon (Sate Babi Under the Trees). It is said so because the sale is commonly found on street sides and below the trees. A fresh snack for everyone. Boiling bananas cut covered with flour batter is the way you make Pisang Ray. Then add some coconut grate on top of it. Some seller make a creation by giving brown sugar. If you like fried banana. However, having doubled-minded to eat it because of the fat, Pisang Rai is definitely a healthy choice for you. Nasi Tepeng can be a choice to replace the usual rice in the morning. It is savory and the texture is mushy, near to porridge. It also completed with fruit and vegetables, which are jackfruit and eggplant. For the protein, fried chicken and egg are the most conventional addition you can put on the plate. 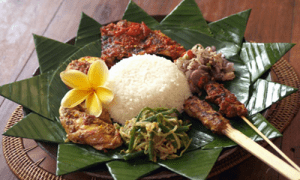 Nasi Tepeng is informed as breakfast typical menu in Gianyar, Bali. 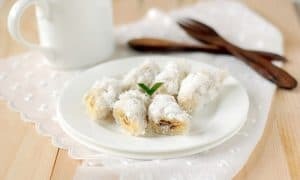 Made from rice flour and mixed with Suji leaf extract is what makes Kue Laklak looks similar with Kue Serabi. It is one of the Bali traditional cookie. Grated coconut will accompany this cookie when served. As an option, brown sugar with Jackfruit cut can be consider if you don’t like coconut. Both of them offer delicious taste. When hear ‘Rujak’ we often will imagine various fruits or vegetables on a plate that served with seasoning. 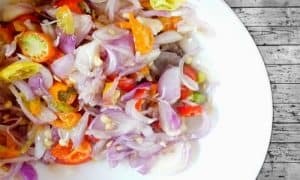 Yet, you can find different concept of Rujak in Bali. Rujak Bulung is made from seaweed as the main ingredient. 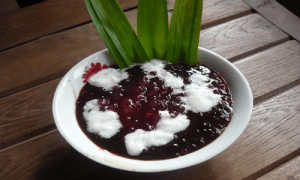 This dish doesn’t seem to be a dessert, because it is usually eaten with rice in a form of ketupat. It will be served, not only with seasoning, but also fried soy with salted fish sauce. Last but not least, here’s the food that in fact compete with Babi Guling for the popularity. Spicy, savory, herb-smell have been an allure for many residents as well as Balinese tourists. 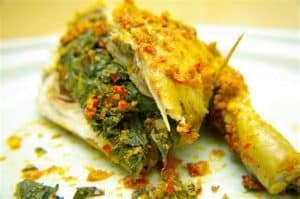 There are two main process to cook Ayam Betutu. The first step is to boil it for several hour, approximately about 3 hours. When it’s done, Ayam Betutu will be grilled or fried according to the customer’s request. Have a fun days in Kuta Bali and one more thing: Enrich your culinary experiences by knowing Typical Dishes in Indonesia.